Hot flashes can be one of the most distressing problems that women face when going through menopause. Many women find that their hot flashes reduce and their night sweats diminish with estrogen supplementation only to be replaced with the estrogen dominant symptoms of anxiety, depression, palpitations, loss of confidence, mood changes and irritability. 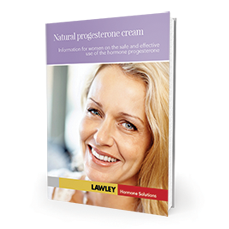 This is simply because supplementing estrogen without balancing the effects with natural progesterone increases the underlying hormonal imbalance. Remember, menopause is the time when ovulation ceases and if there is no ovaluation there is NO progesterone production. Hot flash symptoms are a red, flushed look to the face and neck in light-skinned women. Often a woman will perspire to cool the body down. An increased pulse rate and a sensation of rapid heart beating may also occur. Hot flashes are often followed by a cold chill. A few women experience only the chill. Climacteric, perimenopause, primary ovarian failure resulting in changes in hormonal levels. Hot flashes are thought to be the result of changes in the hypothalamus as a result of this hormonal decline. If the hypothalamus mistakenly senses that a woman is too warm, it starts a chain of events to cool her down. Blood vessels near the surface of the skin begin to dilate (enlarge), increasing blood flow to the surface in an attempt to dissipate body heat. In most women hot flashes diminish with lengthened time of the menopausal transition. A small percentage of women will have hot flashes for life. Counselling as to benefits versus the risks associated with short-term estrogen use. Quality-of-life issues vs potential risks. Alternative non-estrogen based therapies including natural progesterone use may be required. Potential for osteoporosis in longer term.